Asus has been trying to get its fingers on a part of the business-laptop market from the top dogs (Lenovo, Dell, HP, Fujitsu) for quite a while now. The corresponding models are labeled "AsusPro." They are usually consumer laptops that have been slightly modified. That is also true for the P550CA-XO522G. This laptop is no stranger to us since we have tested the identically built X550LD-XX023H, R510CA-CJ862H, and F550CA-XX078D. Our report reveals whether the P550CA is compelling. We used the Lenovo ThinkPad Edge E540 (Core i3-4000M, HD Graphics 4600) and HP ProBook 450 G1 (Core i7-4702MQ, HD Graphics 4600) to classify the laptop. Since the P550CA's build is identical with the X550 / F550 series from Asus, we will not go in-depth about the casing, connectivity, input devices or speakers. The relative information can be found in the reviews of the X550LD-XX023H and F550CA-XX078D. The P550CA uses the same casing as the X550LD-XX023H and F550CA-XX078D. There is, however, a slight difference in the chosen colors. The upper side of the P550CA's base unit is black, in contrast to the silver-gray of the X550LD/F550CA. 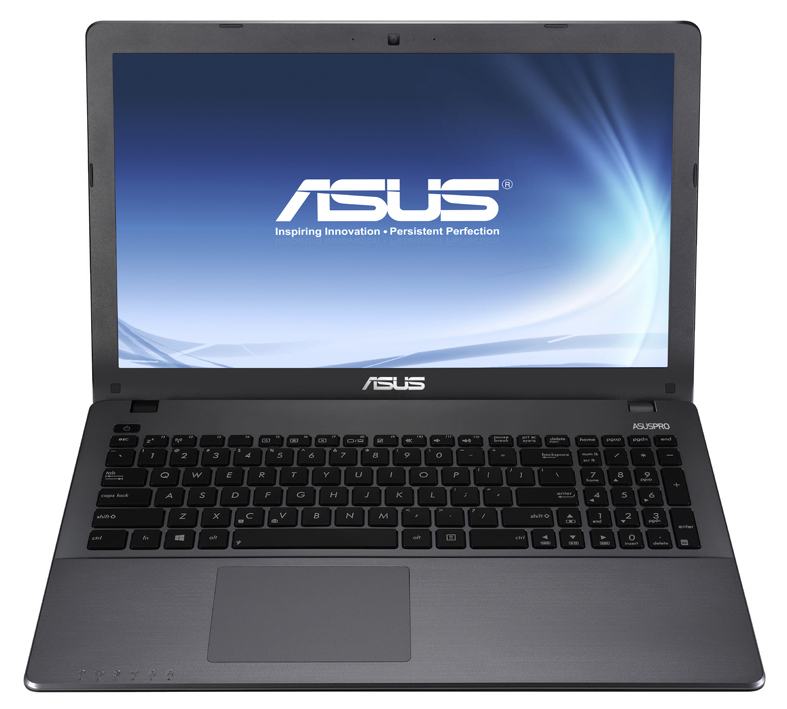 Asus equips the P550CA with a matte, 15.6-inch screen with a native resolution of 1366x768 pixels. The average brightness of 211.3 cd/m² secures a place in the lower midfield. Both the ProBook (202.8 cd/m²; HD) and the ThinkPad Edge (217.2 cd/m²; HD) are also in this range. The contrast of 259:1 and black level of 0.82 cd/m² of the P550CA's screen are not exceptional either. However, neither the ProBook (211:1; 1.08 cd/m²) nor the ThinkPad Edge (289:1; 0.8 cd/m²) offer much better rates. Since Asus pre-loads a color profile, the screen's color rates are quite good. The average DeltaE 2000 shift is 5.3 in state of delivery. Thus, the screen misses the target range of DeltaE less than 3 only marginally. The screen at most exhibits an insignificant bluish cast. It is quite possible to use the P550CA outdoors. However, overly bright surroundings should be avoided. The screen's viewing-angle stability is as can be expected from the price range: very limited. With the P550CA, Asus has a 15.6-inch, office laptop in its product range that is aimed at both small and medium-sized businesses and private users alike. The laptop cannot offer typical business features such as a docking station port or Trusted Platform Module. Our review sample is sold for approximately 480 Euros (~$665). 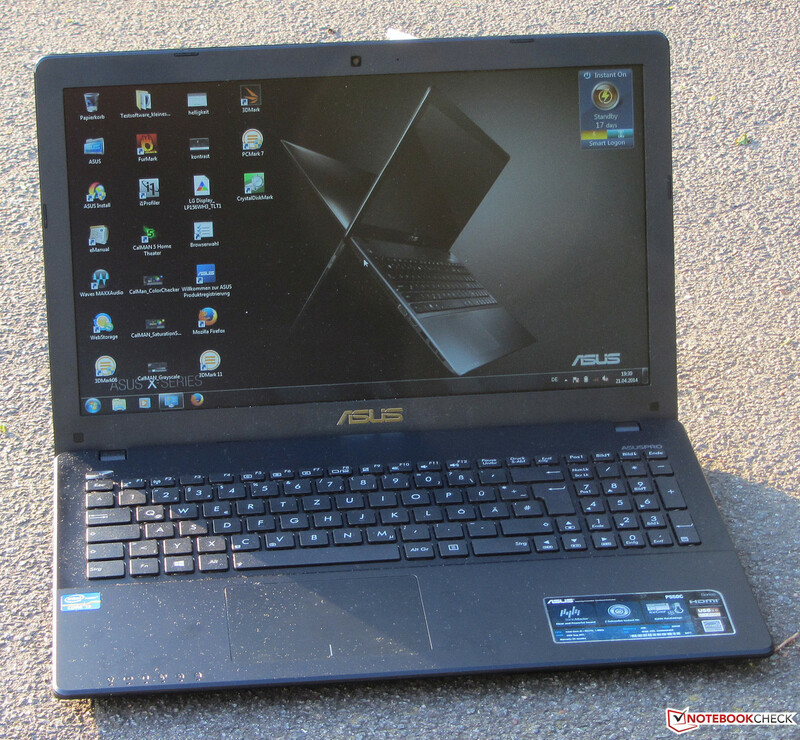 Buyers who do not need either operating system can purchase the laptop for 380 Euros (~$527, model: P550CA-X0522D; note the "D" at the end of the name). The P550CA is powered by a Core i3-3217U processor. This dual-core CPU comes from Intel's former Ivy Bridge processor generation. The processor clocks with a speed of 1.8 GHz and does not feature Turbo. It is a ULV model with a TDP of 17 watts. 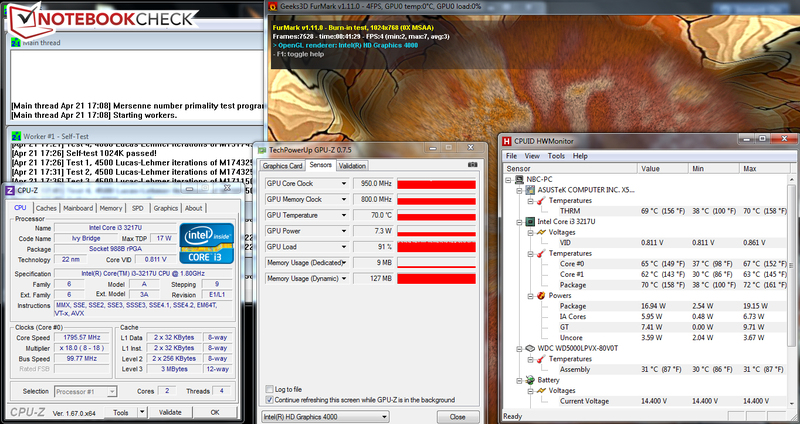 The CPU processes the CPU tests of the Cinebench benchmarks at full speed in both AC and battery mode. The P550CA cannot keep up with the scores of the ProBook or ThinkPad Edge. Both contenders sport stronger processors. The system ran smoothly without problems. The PCMark 7 benchmark score was also very good. 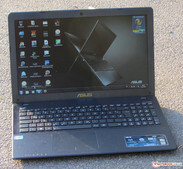 However, Asus' laptop cannot compete with either contender because both sport stronger processors. Our review sample sports a hard drive from Western Digital's Scorpio Blue line. It has a capacity of 500 GB and spins with 5400 revolutions per minute. 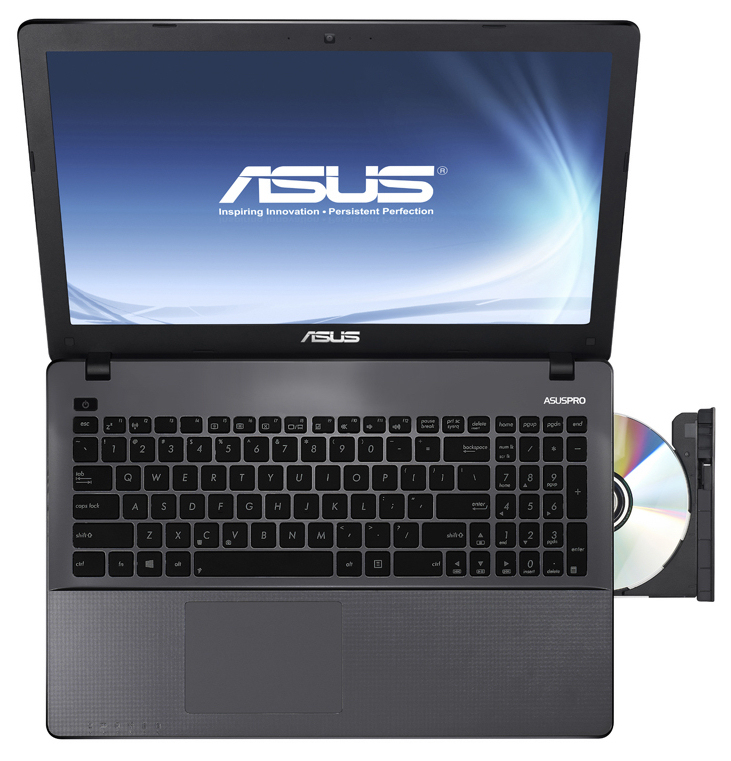 Asus divides the hard drives of its laptops into an operating system partition (186 GB) and a data partition (258 GB) ex-factory. CrystalDiskMark recorded a read speed of 103.3 MB/s. That is a decent rate for a 5400 rpm hard drive. We have to positively note the above average 4k read/write rates. The graphics card in the P550CA comes from Intel and is called HD Graphics 4000. It supports DirectX 11 and clocks with speeds ranging from 350 to 1050 MHz. The 3DMark benchmark scores are as we expected. 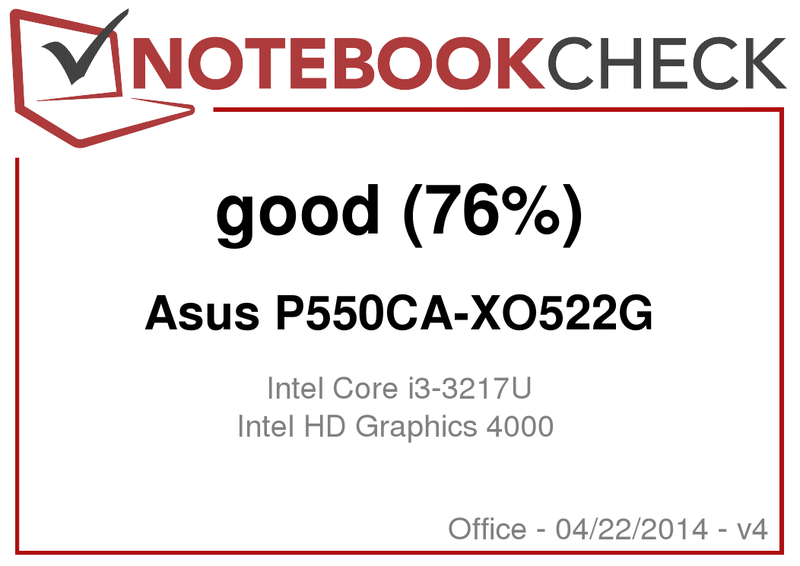 Asus' laptop cannot match the rates of either the ThinkPad Edge or the ProBook because both devices sport stronger GPUs. 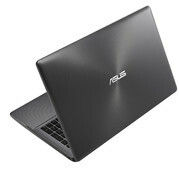 Asus classifies the P550CA as an office device for professional and private use. Consequently, the ability to render computer games is secondary. Nevertheless, a few games can be played smoothly in a low resolution (1024x768 pixels) and low to medium quality settings. A few extra frames can be extracted from the laptop via an extra working memory module. The additional module allows the working memory to operate in dual-channel mode, which maxes out the GPU better. This should make a higher frame rate of up to averagely 20% possible. An office laptop should be as silent as possible. The device does not disappoint in this point. Only a very quiet noise from the fan is heard in idle mode. That is different during load: The fan spins faster and produces more noise. However, it is still within a moderate range. The installed ULV processor does not produce excessive waste heat. Consequently, the surface temperatures of the P550CA are within an acceptable range on every measuring point. The ThinkPad Edge shows a similar behavior. The ProBook exceeds 40 or 50 °C at two measuring points in the fan's area during the stress test. The CPU in the P550CA ran the stress test, where Prime95 and Furmark run for at least one hour, at full speed in both AC and battery mode (1.8 GHz). However, the GPU works with 900 to 1000 MHz (AC mode) and 350 MHz (battery mode). The CPU temperature settled to approximately 70 °C during the stress test (AC mode). The P550CA's idle power consumption ranged from 8.6 to 10.6 watts. Both the ThinkPad Edge (5.4 to 7.9 watts) and the ProBook (6.3 to 8.8 watts) proved more energy efficient, although they - unlike the P550CA - sport standard mobile processors (no ULV). The reason is easily found: Both the ProBook and ThinkPad Edge are powered by Haswell CPUs. The Haswell architecture is generally more frugal than the Ivy Bridge architecture. The P55CA has the lead in medium load via 3DMark06 and during full load in the stress test via Prime95 and Furmark). Here, it can use the advantage of its lower operating voltage in contrast to the processors in the contenders. Naturally, the ProBook has the highest power consumption since the laptop sports a quad-core processor. Websites are automatically opened every 40 seconds in the practical Wi-Fi test. The energy-saving profile is enabled, and the screen's brightness is set to approximately 150 cd/m². The PC550CA achieves a runtime of 3:01 h. That is short for a laptop based on a ULV CPU, and that has additionally been conceived for professionals. Both the ThinkPad Edge (4:23 h) and the ProBook (4:48 h) run longer. The batteries in both laptops have a higher capacity (Asus: 37 Wh; HP: 47 Wh; Lenovo: 48 Wh) than the model in the P550CA. 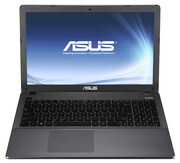 Asus' P550CA-XO522G offers good application performance and mostly a quiet operating noise. Furthermore, the laptop comes with two operating systems and features a matte screen. However, the screen only has a low contrast, and its viewing angles are limited. At least the screen's colors look quite natural. The battery runtime in the practical Wi-Fi test is not convincing. We expect considerably more nowadays. Lenovo's ThinkPad Edge E540 and HP's ProBook 450 are characterized by stronger CPUs, better maintenance options, longer battery runtimes, and superior input devices. The ThinkPad Edge model 20C60043GE (Core i5-4200M, no Windows operating system) is available starting at 520 Euros (~$720). 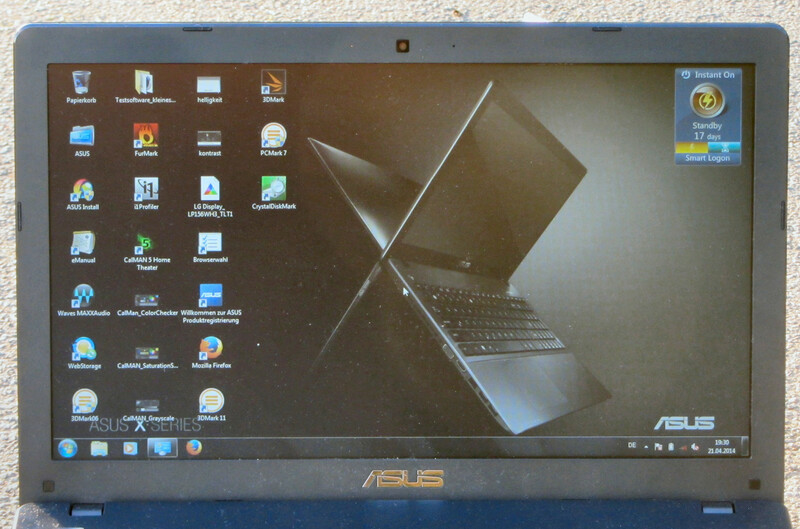 Approximately 580 Euros (~$804) is demanded for the least expensive E9Y49EA model from the ProBook 450 line (Core i3-4000M, Windows 7 Pro + Windows 8 Pro). The low operating noise and two operating systems. 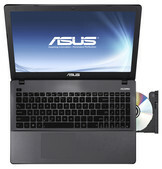 Asus at least includes a separate installation DVD for Windows 8. We don't see that very often nowadays. HP ProBook 450, Lenovo ThinkPad Edge E540, HP ProBook 455, Lenovo ThinkPad Edge E545, Acer TravelMate P255-M, HP 250 G2, HP 255 G2.